Amoebozoans comprise two major groups: the slime molds and the lobose amoebae. Slime molds have a very poor fossil record; there are only two occurrences of fossilized slime molds from Phanerozoic rocks, both in Baltic amber (Eocene in age; Dorfelt et al., 2003, and references therein). 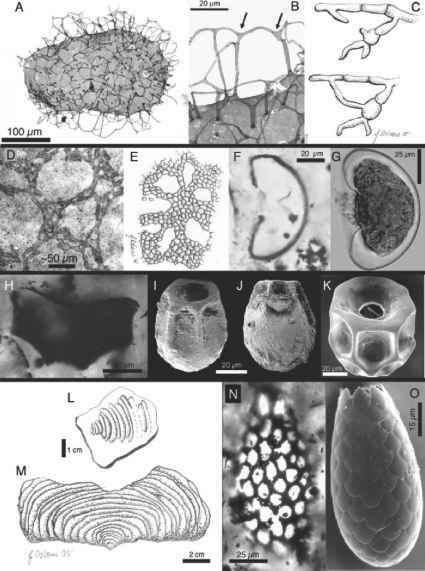 Eosaccharomyces ramosus, an unusual organic-walled fossil from ~1000 Ma shales of the Lakhanda Formation, Siberia, consists of open, web-like colonies of cells, a structure reminiscent of the aggregating cells of cellular slime molds (Figs. 2D-E; German, 1979; 1990; Bonner, 1967; Stephenson and Stempen, 1994; Knoll, 1996). The amoeboid cells of modern cellular slime molds lack cell walls, however, and thus have a vanishingly small chance of being preserved in shale. Although displaying a similar behavior, Eosaccharomyces ramosus itself is not likely to be a slime mold. Meisterfeld, 2000a; Porter and Knoll, 2000; Porter et al, 2003). 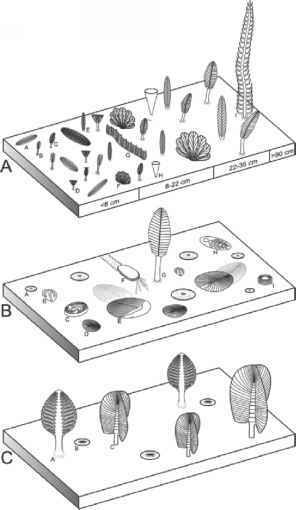 No exact modern analogs can be identified for M. hexodiadema and H. ornata, but P. athanata is indistinguishable from the modern lobose testate amoeban genus, Arcella, suggesting this test morphology may have persisted unchanged from Neoproterozoic times until today. Confirmation of a lobose testate amoeban affinity will depend on a better understanding of test evolution in the Arcellinida, a task currently hindered by poor phylogenetic resolution.